At this point in the current stage of the apocalyptic/epidemic subgenre, it takes more than the bleakness of extended survival to draw one's attention to yet another entry among such a densely crowded field. Thin, dirty people expressing grievances over a lack of nourishment, of safety, and for civilization to return to what it was before the focal catastrophe can still be potent, but they've become familiar through repetition, needing an additional layer of depth to distinguish itself from the rest of the horde. Hidden, the small-scale indie from Matt and Ross Duffer, attempts to both explore the conventional and try something unique by upending the audience's perception of what they've seen beforehand. Despite the well-constructed, unnerving claustrophobia of its focal location and the durable performances from the family cast, there's not enough novelty in the drama where it counts and too much of a reliance on a revelation to make everything that came before it more meaningful than it really is. 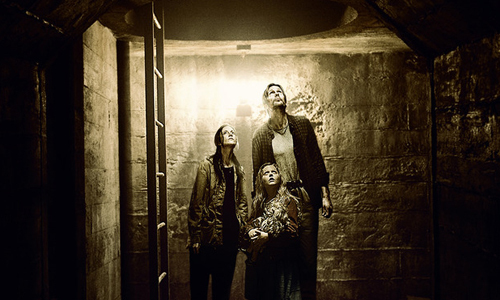 Hidden starts out in the dark underbelly of an unknown suburban town, where a family of three -- father Ray (Alexander Skarsgard); mother Claire (Andrea Riseborough); and daughter Zoe (Emily Alyn Lind) -- have been shacked up in a bomb shelter for the better part of a year. From what, exactly, is something kept from the audience's knowledge at first, though the enigmatic dangers of the surface and the "breathers" scouring the area are enough to keep them underground. Luckily, the family's been blessed with a store of foodstuffs and a sturdy door system to keep them safely locked in, leaving Ray and Claire to try and bring their daughter up in as normal of a way as the conditions will allow, driven by a daily routine of homeschooling, playing games, and reciting a daily set of rules to abide by as they scratch off the days. The conditions in the underneath and the rapidly depleting supplies are growing dire enough that the family's reconsidering their situation, though, and whether a trip to the surface is in order. There's the urge to label what's going on in Hidden as slow-burning suspense, but the interactions between the family members lean closer to ill-omened drama than a gradual development of tension. Makeshift board games, Castaway-like projection of life onto an inanimate object, and arguments about their dissatisfaction over their variety of food instead build into a depiction of a family in it for the long haul, clustering together a lot of recognizable character-building ideas from other films about isolation and the apocalypse. Rattling bass and the oppressive shadows covering most of their living space lend some tense atmosphere to their life and conversations, emphasizing the unpleasantness of their conditions, but the isolation of the bomb shelter -- which has kept them safe for over 300 days -- and the habitual nature of mother Claire's teachings emphasize a sense of security that works against any suspense. The shelter that kept them safe for many months ends up working against the film's ambition. It doesn't help that the people trapped underground in Hidden come across as one-dimensional based on the roles they fill, which is partially by design but also a symptom of the film's deliberate timeframe and seclusion. Some of that is to be expected when we're only offered a glimpse at a day into the lives of those within such a confined space, but these family members also play to overly familiar and simplistic character types, leaving the dramatic tempo feeling overly modest and stale. Andrea Riseborough projects the stern, protective mother who's seen as harsh by her daughter, while Alexander Skarsgard's Ray caving to his little girl's whims presents his as the nurturing figure favored for his lenience. Both actors turn in earnest, albeit anticipated performances that are balanced by Emily Alyn Lind's mature alertness as Zoe, drawing some compassion to their continued turmoil; however, their clear-cut character types are only interesting enough to service the demands of a horror-thriller atmosphere, and their predictable interactions extend long beyond that. Hidden banks on the expectation that this extended time with the family will add more emotion to the tension that's to emerge once the terrors from above intrude on their livelihood, but the plainness and predictability of it all never reaches that desired effect when their lives actually become threatened. Some traditional, routine suspense emerges when they listen for movement up top and observe their bleak surroundings through a makeshift periscope, elevating the film's pulse once the mysterious "breathers" make their presence known and the family stays as quiet and under control as they can. Alas, it all feels like the commonplace machinations of this brand of post-apocalyptic cinema, as if missing something integral that'd elevate the interest level in what's going on. Only much later does Hidden reveal, in a fashion not unlike the more shrug-worthy twists of M. Night Shyamalan's mysteries, that there was another layer concealed all along -- in plain sight within the family's conversations -- about the status of the tainted lands around their shelter. By then, however, it's too little, too late.